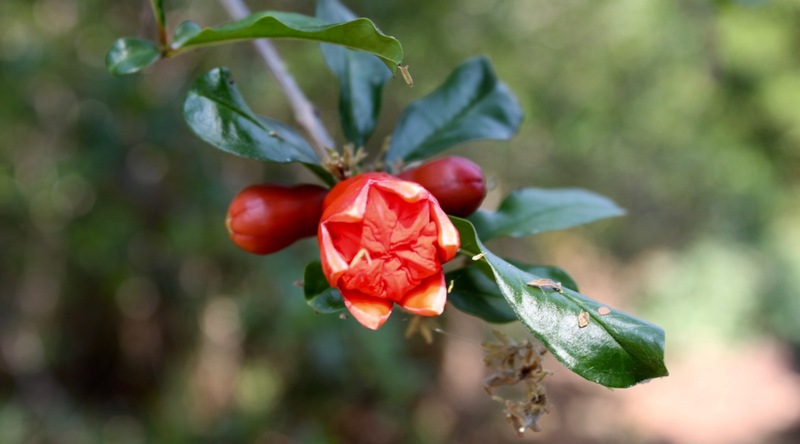 Our pomegranate trees are weighed heavy with flowers and baby fruits right now. This affecting sight reminded me of the following blogpost I wrote four years ago, more or less at the same time of year. For the record: pomegranate molasses is a staple among our preserves! I started making pomegranate molasses earlier this year, inspired by Israeli chef Yotam Ottolenghi and his masterful sensibility surrounding flavours. It’s similar to a balsamic glaze only much more intense and sharp. It’s used in a similar way, too: in a salad dressing, as a marinade or glaze, in slow food, as a syrup on other fresh fruit, or ice cream. I imagine a drop of it would also be tasty in a glass of champagne, or in a cocktail.